Now little more than a rusting hulk, the Belford 99 car at this railyard in the Milo village of Derby once hosted presidents and tycoons. Former Maine resident Lindsey Bell aboard the Belford 99 railcar, which is now at a rail yard in Derby. 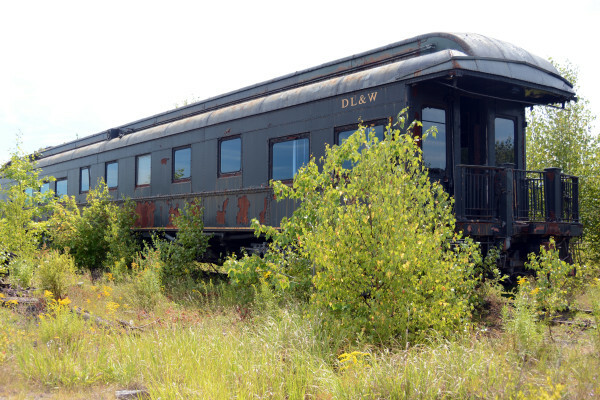 Former seasonal Maine resident Lindsey Bell hopes to restore a business railcar once owned by her family before it is removed from its siding at a rail yard in Derby. 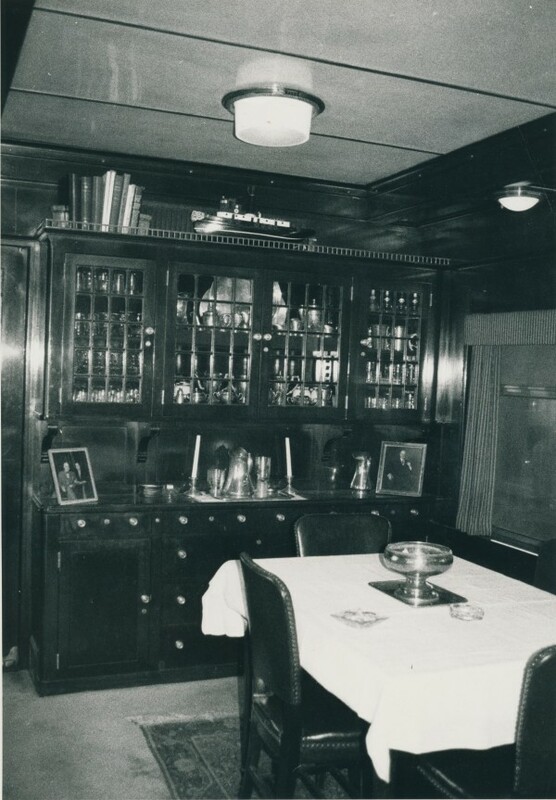 Gold cutlery was once a part of every meal aboard this luxuriant business railcar. Several fires and acts of vandalism have turned the Belford 99 car at this railyard in the Milo village of Derby into a significant revitalizaion project. In its better days, the business railcar once owned by the Bell family of General Mills fame probably summered with the family in Maine. Although it can be purchased for far less, it would take an estimated $500,000 to fully restore the Belford 99 car at this railyard in the Milo village of Derby. 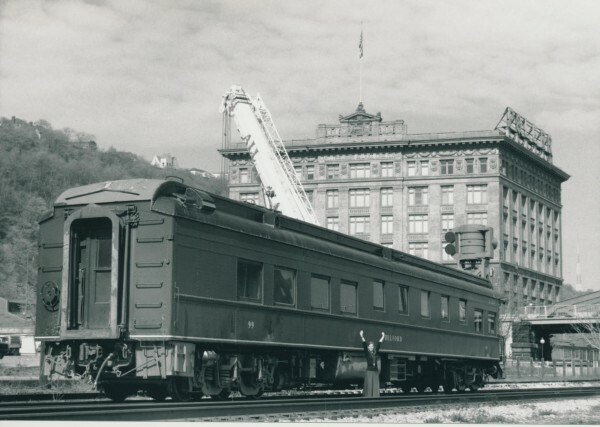 In its better days, the business railcar once owned by the Bell family of General Mills fame was a most luxuriant conveyance. 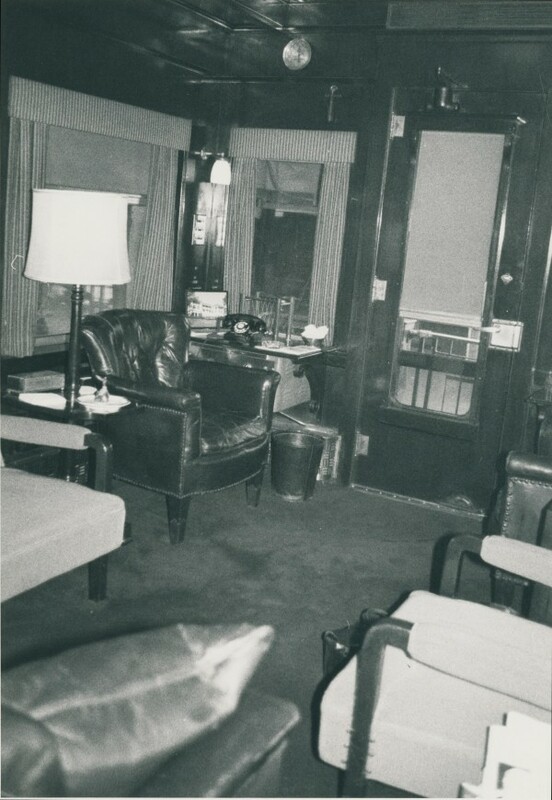 In its better days, the business railcar once owned by the Bell family, which summered on Mount Desert Island, was among the most well-appointed conveyances of its type. 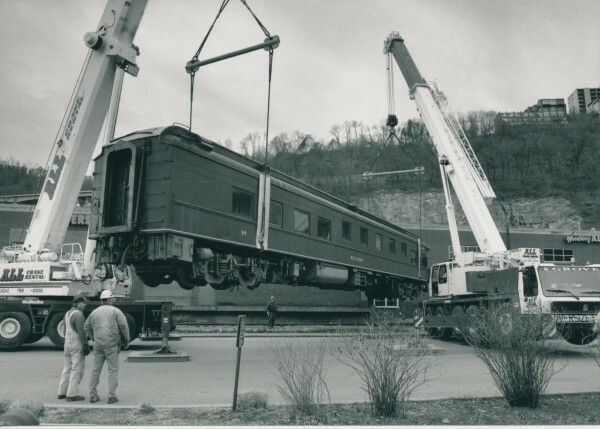 The Belford 99 railcar, which is at a rail yard in Derby, was saved in Pittsburgh in 2000 but faces a far different fate if it isn't at least moved by Dec. 31. 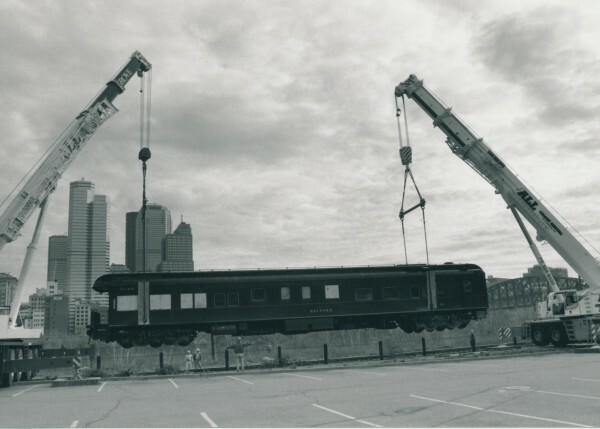 The Belford 99 railcar, which is now at a rail yard in Derby, was saved in Pittsburgh in 2000 but faces a far different fate if it isn't at least moved by Dec. 31. 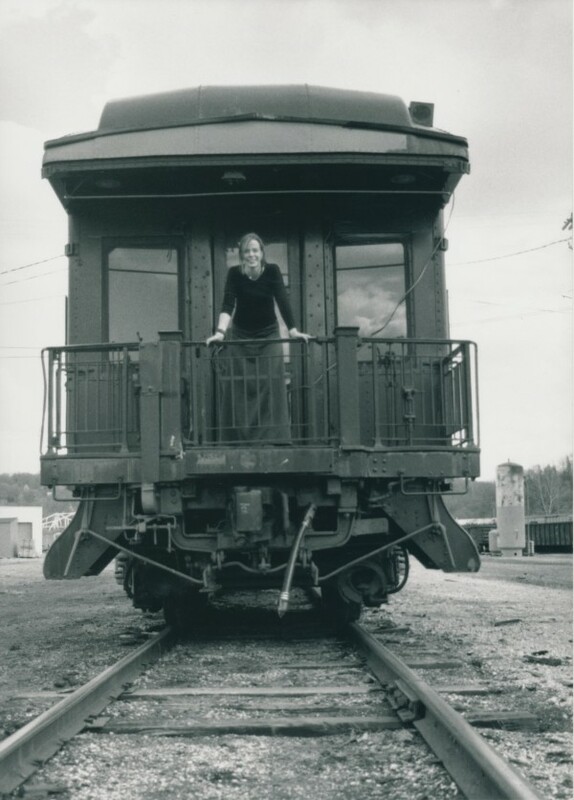 Former Maine resident Lindsey Bell lifts her arms in triumph after having worked to save the Belford 99 railcar in Pittsburgh, Pennsylvania, in 2000. 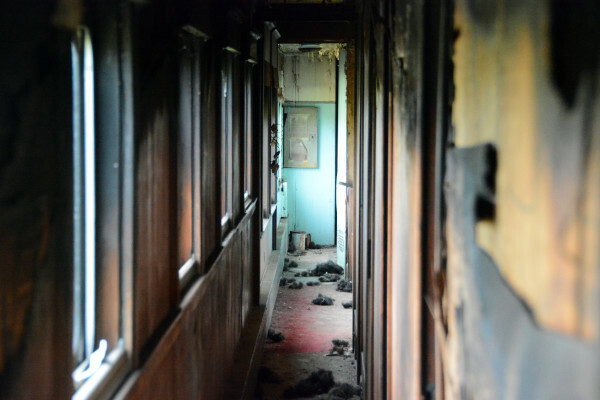 MILO, Maine — Some of its walls are burned black, others marred with deep scratches. Its seat cushions are torn and distended, its floors littered with trash, and its sides flake Pullman green paint to reveal large, ugly, reddish patches of rust. But more than 60 years ago, the Belford 99 railroad car carried Presidents Hoover, Truman and Eisenhower on whistle-stop campaigns around the Northeast. Built in the middle of one of America’s most prosperous times, the Roaring ’20s, it is a symbol of American industrial might, of democracy and the blue-collar workmen who earned good living wages making and maintaining the Belford and other cars like it. Now, the historic car has about four more months until it is scrapped, unless owner Lindsey Bell can find someone to remove it from its sidetrack in the Derby village area and restore it to her specifications, she said. Bell estimates it will cost $40,000 to buy the car and another $30,000 to make it track-worthy again. An actress, screenwriter, recreational aerobatic pilot and seasonal Northeast Harbor resident, the Los Angeles-based Bell cannot afford the estimated $500,000 it would take to fully restore the 90-year-old railcar. 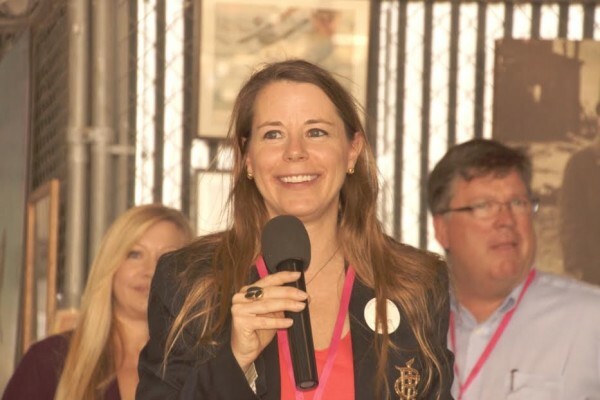 Bell inherited the 200,920-pound business car from her father, the late Peter Bell, grandson of General Mills founder James Ford Bell. 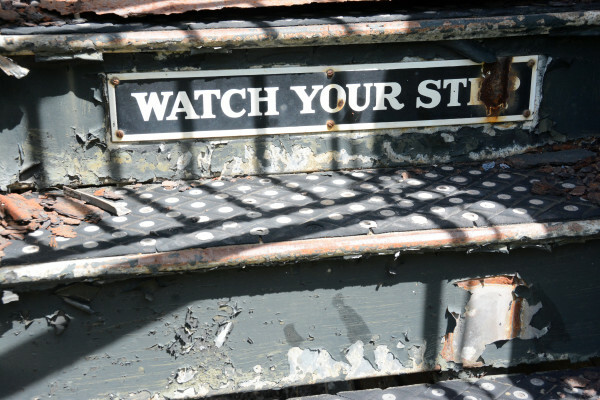 Bell’s requirements probably would cost more than most collectors can afford, said Richard Glueck, president of New England Steam Corp., which is attempting its own revitalization of a Maine Central Railroad N0. 470 steam locomotive at Washington Junction, an industrial neighborhood of Hancock just across the city line from Ellsworth. 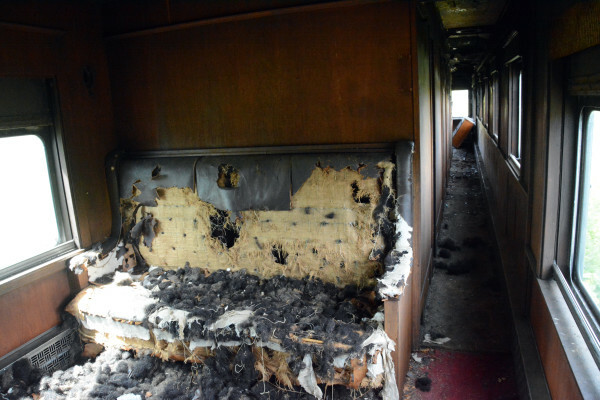 There might not be enough time to get the railcar restored. Officials at Central Maine & Quebec Railway lease the land at the railyard in the Derby village area of Milo, where the Belford 99 resides. They sent Bell an email in July 2015 saying she had 30 days to remove the car or begin paying $600 per month to continue to keep it there. Company officials eventually extended the removal deadline to the end of this year. Bell said the previous railroad company owner, Montreal, Maine and Atlantic Railway, charged her $600 annually to keep the Belford on railroad property. Central Maine and Quebec closed on its $15.85 million bankruptcy purchase of Montreal, Maine and Atlantic Railway in mid-2015, after a runaway MMA locomotive killed 47 people in a disastrous crash in Lac Megantic on July 6, 2013. Central Maine & Quebec General Manager Chad Mowery said the Belford is among a half-dozen rail cars that need to be moved from the railyard, which the company leases from the MM&A estate, before the yard is transferred to the town of Milo for economic revitalization. The leftovers are likely the dregs of a Montreal, Maine and Atlantic sale of 35 cars in 2014. Central Maine would like to sell them, but they have dubious value as scrap. Most are badly damaged, rusted or riddled with asbestos, Mowery said. “They need tens of thousands of dollars to move on their own. We have had interest from various museums or collectors, but nobody serious,” Mowery said. “To people who are fans of railroads or railroad passenger history and the nostalgia behind that, they represent a loss. I don’t know if that would be represented in dollar value. They hold more of a sentimental value,” Mowery said. 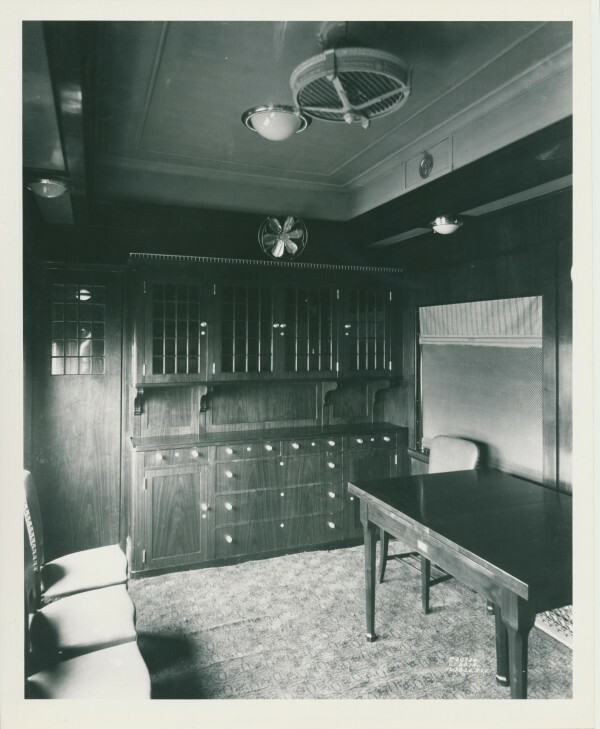 According to Bell’s history of the Belford, car 99 was built in 1926 by Pullman for financier George F. Baker Jr., who at the time was a director at Pullman Co., as a birthday gift for his wife, Edith. The car originally was named simply “99” for his graduating class of 1899 at Harvard University. With four bedrooms, the car comfortably sleeps 10 and includes staff quarters off the kitchen. The staggered windows allow passengers to see out from the car passageway and the steel-plated flooring added later was designed to safeguard the car against German saboteurs during World War II. As touches of grandeur, the original screws around the windows were silver-plated, and the original china and tableware were gold. “The inside of it was beautiful, particularly the business end. 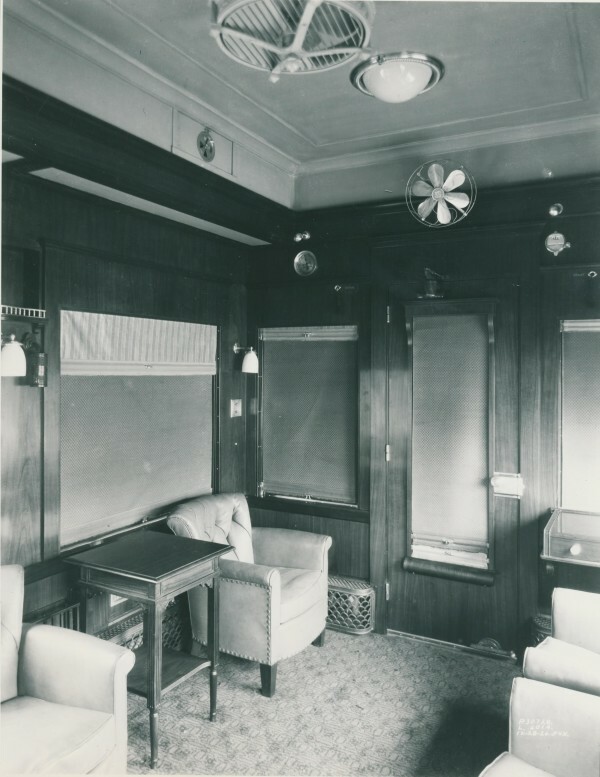 It had walnut paneling, big mirrors and brass fixtures … This kind of thing will never happen again in American transportation,” said Glueck, who has visited the Belford in Derby. Bell, who grew up riding in the car with her father, loves imagining what the Belford’s first years must have been like. “She is from the Roaring ’20s. Think of all the fun that’s been had on her,” Bell said. The car’s passengers included Hoover, financier Bernard Baruch and aircraft magnate William Boeing. Campaign trips included Truman’s ride from New York City to Binghamton and Elmira, New York, in 1948; Eisenhower’s to Buffalo in 1952; and Nixon vice presidential candidate Henry Cabot Lodge’s trip from Hoboken, New Jersey, to Binghamton in 1960. Peter Bell bought and renamed the car in 1968. Bell donated the car to the Smithsonian Institution, but it ran out of room to store it and eventually gave it back. In 1980, he then loaned it to Pittsburgh History and Landmarks in Pittsburgh. It sat at former train-station-turned-shopping-mall Station Square, where vagrants burned and looted the Belford, and when the owners of Station Square wanted all railcars removed, ownership reverted to Bell. “My father was now living in Cuernavaca, Mexico, and his health was declining. He knew how much I loved the car, so he gave her to me to rescue,” said Bell, who always refers to the railcar with personal pronouns. The Belford came to Maine in 2002 as equipment stored for Bell by the Bangor & Aroostook Railroad when MM&A bought the B&A. The last living tie to its glory years, Bell, 44, said she hopes serious railroad aficionados will be attracted to the Belford’s history and see a future for it, perhaps as a place for wedding receptions or excursions. “How fun for a group of inner-city children to ride a restored 1920s rail car? What a mind-growing experience,” she said. Anyone interested in purchasing or helping revitalize the Belford can contact Bell at lindseygpbell@aol.com.